Picking your wedding dress is considered one of the most important parts of the bridal planning process. Many brides hear the same common advice over and over, but they are still unsure about how to make the most out of the appointment. That is why I have shared with you 5 unique tips that will help you find your dream dress! As mentioned in my how to create your wedding brand blog, having a firm understanding of what tone you are going for is of vital importance. If you are having trouble with picking a lane and sticking to it, I suggest physically writing down 3 words that describe the dress you want. For example: conservative, traditional, and romantic. 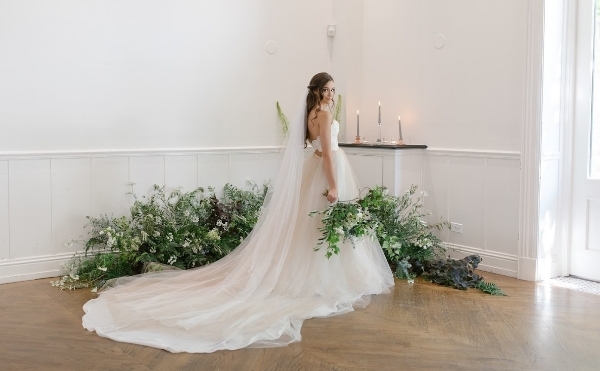 These are 3 simple words that every bridal stylist can understand, and will really help clarify exactly what you are looking for. It also could very well trigger a dress they carry to their mind! Shopping for your dress at least 9-12 months before is a key tactic in finding the perfect dress. It allows the opportunity to plan your wedding around your dress, which many brides say gives them more freedom in picking what they really want. For instance, if you have already booked your beach wedding, but fall in love with a heavy ball gown, you are going to be a hot sweaty mess, and will ultimately have to either change venues or let go of your dream dress. You don’t want to be restricted with what you can try on just because it doesn’t match the details of the event! Shopping early will ensure that your options are wide open, and when you fall in love with the perfect dress, you have no problem saying yes! With all the chaos of wedding planning, it’ll be easy to show up to your dress appointment with a messy bun, and zero makeup. You are tired, stressed, and think no one important is going to see you. But - if you want to make the most out of this process, doing your hair and makeup beforehand is key! For some, trying on any form of clothing in front of other people can be nerve-racking, especially when it’s a wedding dress. Getting ready before the appointment will not only give you have an extra confidence boost when looking in the mirror, but you will also show you what the dress will look on the big day (and therefore a better chance of making your entourage cry). Sometimes when you know, you know. It’s always fun to play dress up and try on a couple more, but there are many brides who fall in love with the very first dress they put on! You may want to try and “one-up” the dress, having the mindset that you can always find something better. However, if that’s your mantra, then you will never be satisfied with a dress. Bottom line: If it feels right, then get it. Go with your gut! Remember you are going to be in many different positions on your wedding day – sitting, standing, walking, dancing (need I go on?) and therefore should try out some of those movements when trying on dresses. If you find a gown you are truly considering, walk around the store a little bit, and make sure to sit down a couple times. That way if every time you take a step the tulle rides up you-know-where, then that’s probably not the right dress! Hey there, I hope you’re enjoying my blogs! If you want to know a little more about the girl behind the brand, click here!